Discover this Single Malt's powerul breton sea breeze! 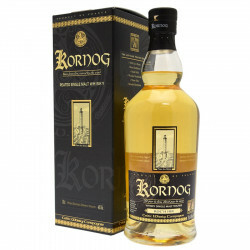 Kornog Roc'h Hir is the peated expression of the Glann Ar Mor distillery, located on the north coast of Brittany. This Single Malt has aged in Bourbon barrels, bottled at 46°, is non chill filtered and with no articial colourings. This Single Malt has a peated character with a unique taste and nice balance between the smoke and fruits. Kornog Roc'h Hir has been awarded best european whisky in 2016 by Jim Murray. Nose: nice mineral and fruity notes. Palate: very fresh and peated with herbal notes of mint and vervain to finish on fruit (pineapple and mandarin). Finish: very long, soft and fruity. 2016 Whisky Bible Jim Murray: best europeen whisky.